Create test scripts without programming, saving time and reducing test complexity. Access the test editor for high-level detailed views of tests and transactional information. See test results displayed in a browser-like window and integrated with the test editor, which lists the web pages visited during test. Root cause analysis helps identify both the source code and physical application tier that are causing the bottleneck. Sequence diagrams trace all activity that occurred just prior to the bottleneck. Multiple resource statistics can be viewed from any tier of the system under test, exposing hardware-related bottlenecks responsible for poor performance. Generates performance and throughput reports in real time, offering immediate awareness of performance problems at any time during a test. Multiple filtering and configuration options can be set before, during and after a test run. View performance trends from one build to another. System performance metrics help you make critical application release decisions. 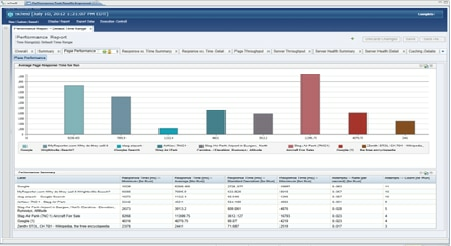 IBM® Rational® Performance Tester produces deeper analysis with reports on items such as response time percentile distributions. Offers flexible modeling and emulation of diverse user populations while minimizing the memory and processor footprint. A spreadsheet interface is provided to enter unique data, or pre-existing data can be imported from any text-based source. Custom Java code is inserted into performance tests to generate activities such as advanced data analysis and request parsing. Supports load testing against a broad base of applications such as HTTP, SAP, Siebel, SIP, TCP Socket and Citrix. User loads can be tested from remote machines using an execution agent. A flexible graphical test scheduler where load can be specified by proportional user groups is provided. Automated data relationship management is enabled to identify and maintain application data relationships for accurate load simulation. Use the cloud to enable large-scale and globally distributed performance testing. Load generation capacity is extended for HTTP, SOA and socket tests as-needed with a pay-as-you-go model using the public IBM Cloud. VMWare private cloud is currently available for load testing on a trial basis.